When Peggy moved into assisted living a year ago, she thought her days of travel were over. Instead, she’s cavorted with penguins in the Antarctic, was wowed by the Northern Lights, and marveled at a Hawaiian volcano. It’s all been made possible by an innovative program at Regal Palms and Royal Palms in Largo, Florida. Because it’s such a new technology, many people think of Virtual Reality (VR) simply as an entertainment. 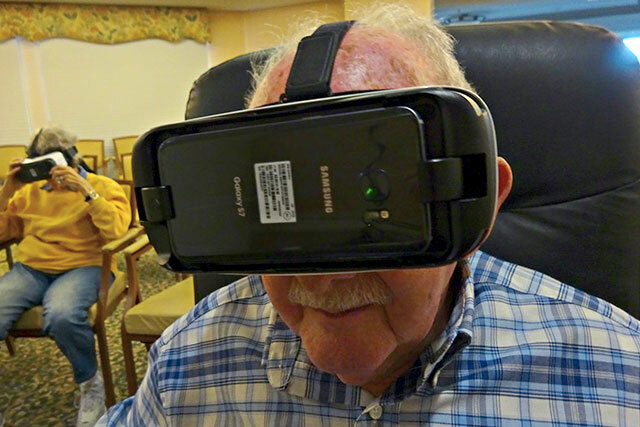 However, The Goodman Group has partnered with the MIT-based start-up Rendever to use VR technology to help residents living in senior living communities restore a sense of wonder, exploration, and connectedness with the world and each other. “As an organization, we’re always looking at innovative products that are coming into the market,” explains Katie, national director of life enrichment for The Goodman Group. When Rendever approached The Goodman Group to set up a pilot program, it seemed a natural fit. “The pilot program started in January at Regal Palms, an assisted living community at The Palms of Largo,” notes Phyllis, national director of research and development for The Goodman Group. There are currently two groups at Regal Palms, where two of the participating residents are over 100 years old! The program has become so popular that there’s a waiting list. A third group has recently started at Royal Palms. A group of 8-10 residents gathers in a common room, like a library or exercise area, where they can be seated comfortably. A trained facilitator explains the program and the group decides together where they want to explore. There are many destinations to choose from — The Eiffel Tower, a Hawaiian beach, Niagara Falls, the South Pole, or the interior of a European palace are just a few examples. The facilitator helps residents put on and adjust their headsets, then guides them through a 20-30 minute adventure. While the facilitator shares information about the destination and can respond to participants questions, the seniors themselves control their headsets by “looking around,” just as they might in person. It’s common to hear “ooohs” and “aaahs” as residents explore the location. Other residents will share experiences if they’ve traveled to that same destination in the past — creating a whole new awareness of each other’s life before moving to the community. 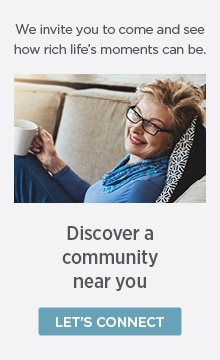 The Rendever equipment is specially designed for seniors to be as easy as possible to use. A smartphone snaps into the headset, which does not use headphones or a hand-held controller as other VR units do. The facilitator adjusts the program so everyone is seeing the same thing and it’s in focus. Participants remain seated but are able to “move around” within the experience, simply by moving their heads. Another experience is simply of a cat jumping out of a box and onto the participant’s lap. “You can actually see residents petting the cat,” Katie says. VR offers experiences for residents that they wouldn’t otherwise have, and that they very much want. “We’ve looked at isolation and loneliness of our residents and they’re saying they want to be connected" Phyllis explains. "They want people to know who they are. With VR, we can take them to places that are meaningful to them." You can learn more about Rendever, meet the inspired developers behind it, and watch seniors’ delighted — and at times profound — reactions in this video.